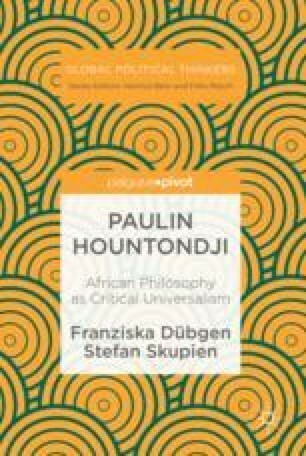 Hountondji’s contemporaries reacted to his critique of ethnophilosophy and his vision of how African philosophy should be properly done and fostered a vibrant discussion on the methods, scope, and standing of philosophy in the African context. The chapter resumes the main elements of this debate, including the topic of who philosophises (the individual or a collective), of the question of orality versus textuality of philosophical praxis, the nature of science, and the role of popular knowledge in academia. The chapter concludes by considering the ambivalent character of ethnophilosophy in the time of its emergence and in contemporary scholarship. Nkulu-N’Sengha, M. (2017). Bantu Philosophy. Available at: https://www.britannica.com/topic/Bantu-philosophy. Published June 23, 2017. Accessed 14 August 2018.